Nothing can instantly transform your home like a lush array of houseplants. Besides prettying up the space, plants clean the air and can even have a positive effect on your mood, health and productivity. What’s more, when you choose the right varieties, plant care is a cinch. boost mood and help you feel more creative. Plants are the perfect complement to humans when it comes to the gases breathed. All day long we take in oxygen and release carbon dioxide; plants do the opposite, taking in carbon dioxide and releasing oxygen back into the air. 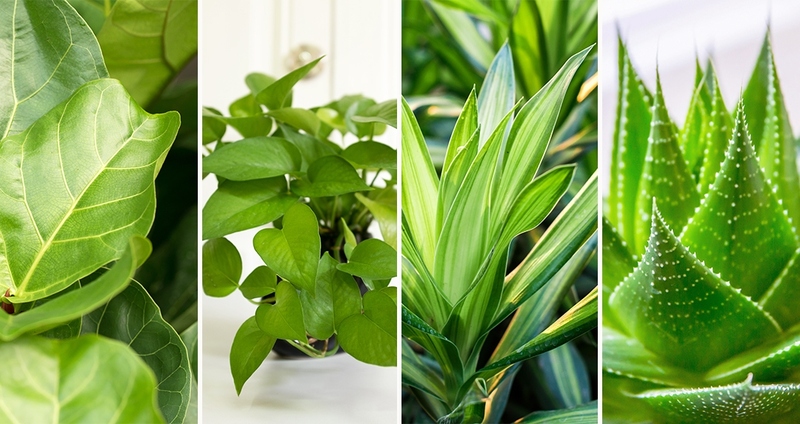 In the process, they can even neutralize harmful chemicals that commonly off-gas from furniture, flooring and paints—peace lily, English ivy and spider plants are three easy-to-grow varieties that do a particularly good job. Toxin-free air is a plus; so is less stress. Studies have shown just having greenery in view can decrease anxiety and blood pressure, boost mood and help you feel more creative. If that’s not enough to convince you to green up your home, here are a few more hardy plant varieties that even self-proclaimed “brown thumbs” can grow. Glance through any decorating magazine or blog and you’ll see plenty of these beauties. They do best in bright, filtered light, with regular watering when the top inch of soil gets dry. Fast growing and super forgiving, pothos can thrive in bright and low light, as well as both pots and vases. They are also easy to propagate—just pinch off a leaf, root in a jar of water, then plant. This is the perfect plant for those mid- to low-light areas of your home. They can even tolerate a missed watering or two. Dracaenas boast dramatic leaves, and some varieties can grow as tall as six feet. Why not have a plant that can do double duty—looking good and healing wounds? Like most succulents, aloe prefers warm, sunny spots and infrequent watering. For minor cuts and burns, clean the area, then snap off a small piece of aloe and apply the inside pulp to the wound before bandaging.